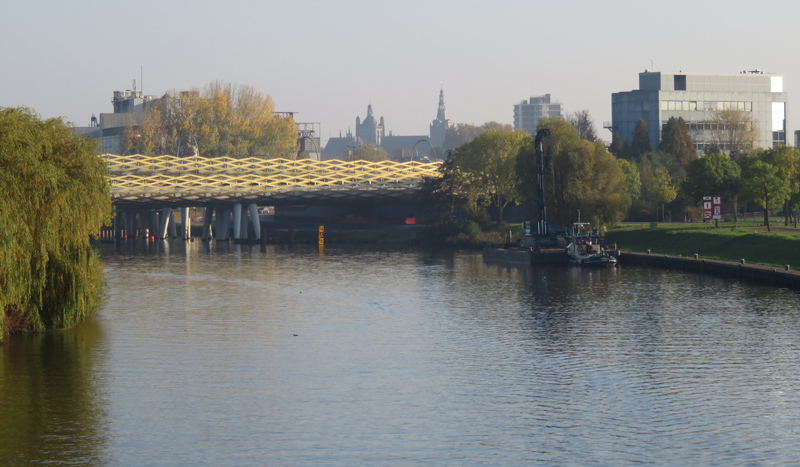 “The Royal Welsh brug” is the name of a new bridge over the river Dieze in ’s-Hertogenbosch. With that name the city wants to honour the men of the 53rd Welsh Division (now Royal Welsh) who liberated the city in October 1944, after four-and-a-half years of Nazi occupation in World War II. Some of the men had to pay the highest price. Their 146 names were set in steel on the bridge. This Roll of Honour will serve as a lasting memory of the connection ʼs-Hertogenbosch feels with the brave young men of Great Britain and Wales in particular, who were instrumental in regaining the freedom of the city. The golden fishnet stocking of the Royal Welsh bridge over the river Dieze with the ’s-Hertogenbosch cathedral in the background. The new bridge consists of two connected bridges. One for motor traffic and one for walking and cycling. Both are 10 metres wide. These bridges were built right next to a set of new railway bridges that were built a short time earlier. The city asked the architect of the railway bridges – Marius van den Wildenberg, from ʼs-Hertogenbosch – to also design these bridges. This means all new bridges look alike. Concrete bridges sitting on elegant pillars and clad in a golden aluminium ‘fishnet stocking’. 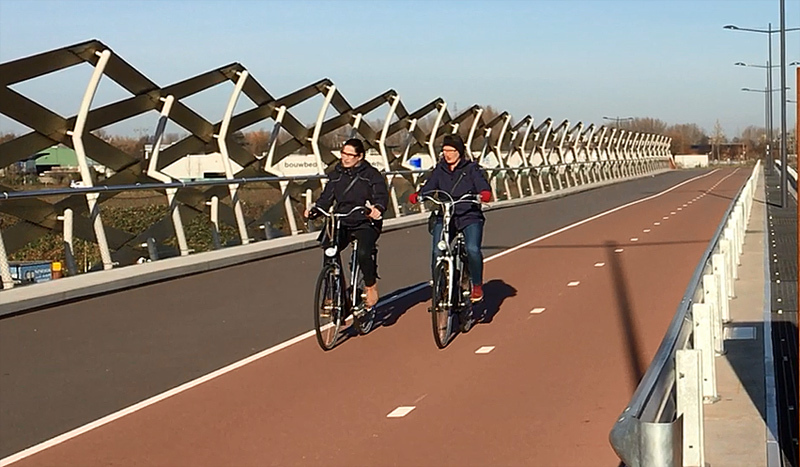 The bridge for motor traffic and the one for walking and cycling are identical in width (10 metres). Which means there is a lot of space for walking and cycling (circa 5 metres for each). The original railway bridge had to be replaced. The steel bridge was at the end of its life span and the railways wanted to expand the railways from 2 tracks to four. This means the trains to Utrecht and those to Nijmegen now each have their own two tracks. One of the tracks from Nijmegen even flies over the tracks to Utrecht. That means trains no longer have level crossings, which ends delays caused by trains having to wait for each other. People sometimes ask why the sidewalks are so narrow in the Netherlands. But that is often an optical illusion. The cycle tracks are so wide that the sidewalk seems narrow. In fact the sidewalk is wide enough for two people in a wheel chair to be pushed side by side. This is the cycleway leading up to the Royal Welsh bridge in the distance. You can see clearly here that the roadway has one separated lane for each direction. The road bridge is completely new, there had never been a road to cross the river here. It was built to connect an important east-west through route north of the river Dieze to the south circular road around ’s-Hertogenbosch, that was built some years earlier. An existing smaller road on the west side of the railway tracks was upgraded and connected to that circular road in the south. With this bridge it was now also connected to the main east-west road. The new road offers an alternative for the former north-south route, that runs on the east side of the railway, right next to the historic city centre, and past the central railway station. In time, this new road will make it possible to downgrade that original road for motor traffic and to upgrade it as place. 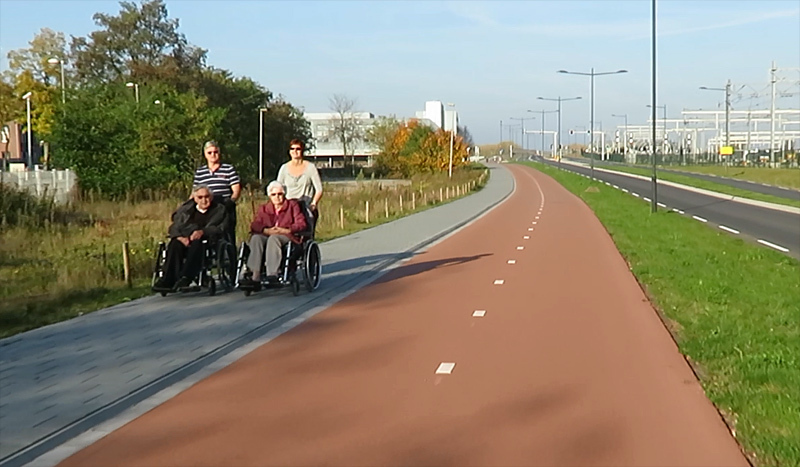 Cars will then be guest in a 30km/h zone that will be designed for people. One part of the old route was already changed. The original 4 lane Vughterweg has been changed into a 2-lane road. The rest of the reconstruction will be taken up in future. When I filmed the rides last year the trees had not yet been planted. The present situation is like this. 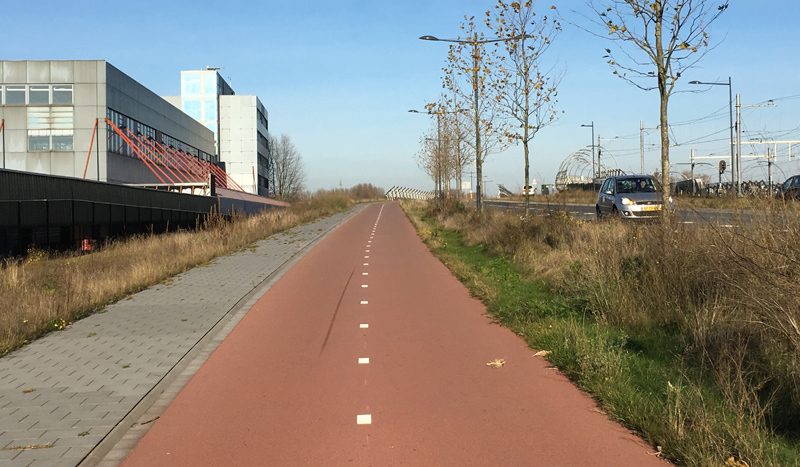 A line of trees and some shrubs have been planted in the strip between the roadway and the cycleway. The new road also makes it possible to further redevelop the area west of the railway. This former industrial zone has been changing into a residential area in the last 20 years. The road gives better access to the north of this area, that has yet to be redeveloped. A viaduct near the station had to be widened but the Royal Welsh Bridge was by far the largest infrastructural work that had to be constructed for this new road. The total cost for the entire road, including the bridge and viaduct, was about €27 million. 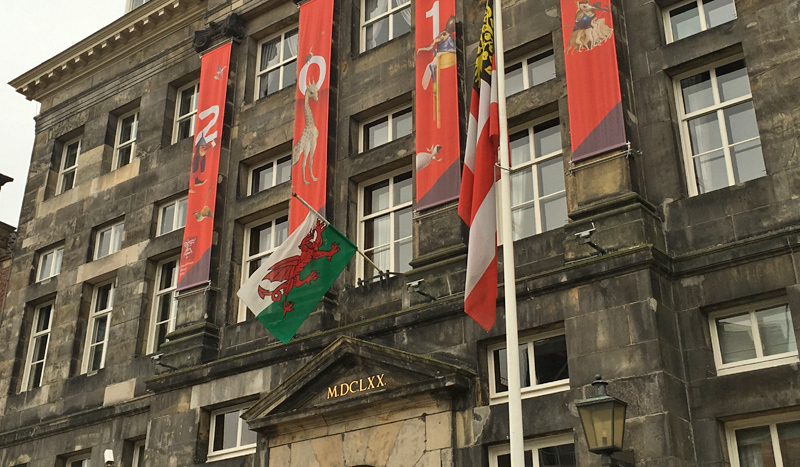 Every year in October the Welsh flag flies from ’s-Hertogenbosch city hall. Two windows of this building show the names of the fallen soldiers. City hall also has a Welsh Room. The Royal Welsh bridge had been opened for traffic in July 2015, but the official opening was on the 27th of October that year. In the presence of a small delegation of Welsh veterans the Roll of Honour was unveiled. Gwilym Rees died on 23 October 1944 in the advance into the Netherlands. A very Welsh name on a bridge in ’s-Hertogenbosch. Some of the men were very young when they gave their lives for freedom, Gwilym was just 19. The British veterans had visited ’s-Hertogenbosch every year since World War II. 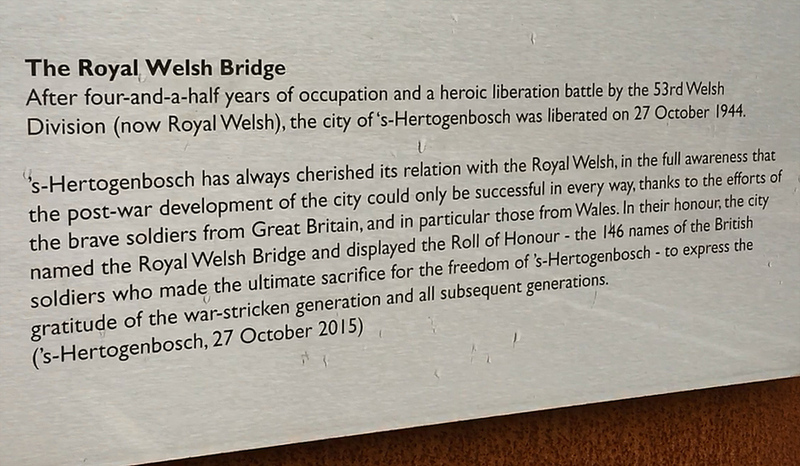 The city cherishes the relation with the Royal Welsh, “in the full awareness” – as a plaque on the bridge informs – “that the post-war development of the city could only be successful in every way, thanks to the efforts of the brave soldiers from Great Britain, and in particular those from Wales.” The battle for ’s-Hertogenbosch, part of the advance into the Netherlands to reach enemy Germany, had been a hard-fought victory for the 53rd Welsh Division. Supported by the 1st battalion of the East Lancashire Regiment, the city was liberated on 27 October 1944 after four days of heavy battle. A plaque on the bridge informs people in both Dutch and English about the reason to name the bridge “The Royal Welsh Bridge”. Another monument for the 53rd Welsh Division can be found at the Hekellaan, where the men ran into the city centre under heavy enemy fire. 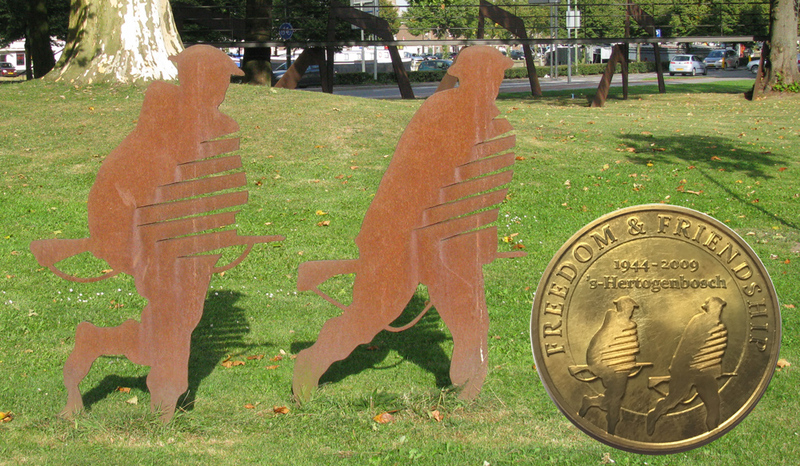 This monument served as an example for the commemorative medal handed to all veterans in 2009. The medal was made by Lei Lennaerts. There are more places of honour for the 53rd Welsh division in the city. Two windows of city hall also show the 146 names of the fallen soldiers and there is a Welsh Room. The Welsh Memorial had been the site of the annual commemoration ceremonies. In 1952, when it was unveiled, Pathe News reported about this monument. In 2009, 65 years after the war, there was a far bigger celebration. Many of the men were getting too old to make the annual trip. A parade was to end an era in a grand way. But also in the years after that big parade, the men kept coming and the city kept welcoming them, but the group has become very small now. In 2016 just two veterans were guest of honour at the commemoration. With this generation slowly vanishing it is good that the bridge will serve as a lasting memory of the connection between ’s-Hertogenbosch and Wales. The two rides in the videos. The red line follows the entire new relief road. The green route is the road that crosses under the Royal Welsh bridge. Video showing the red ride on the map. Video showing the green ride on the map. Both rides end in the Zandzuigerstraat. I described that street’s reconstruction in an earlier post. 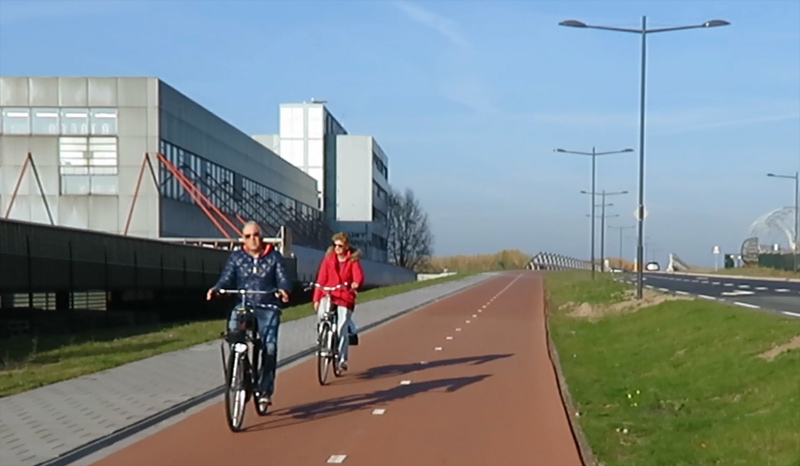 That’s the first time I’ve seen Armco (safety fencing) next to a cycle track! Expecting trouble? Well, there is space between the two bridges, so yes, you would want some fencing to protect people. They need to stay out of the trouble of getting in between the bridges! I don’t know if you know this Mark, but in English, fishnet stocking has a rather negative connotation, except in Los Vegas. We Dutch connect it with the Moulin Rouge in Paris. Why go to Paris when the appropriate nightclubs are always at home in each city in the NL? OK, away from the promiscuity jokes, I also wonder what it’s like to walk in the Netherlands. 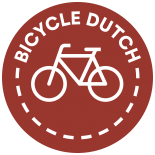 I realize that you didn’t name the blog WalkingDutch, but while you did film yourself walking from your home to the railway station a few years ago demonstrating commutes, but that’s in the city centre. Do other places in the city feel like it’s like on a human scale street or do you feel like you’re often walking without really going anywhere with any sort of speed (like how I feel if I try to walk next to a 60 km/h city arterial in my city)? 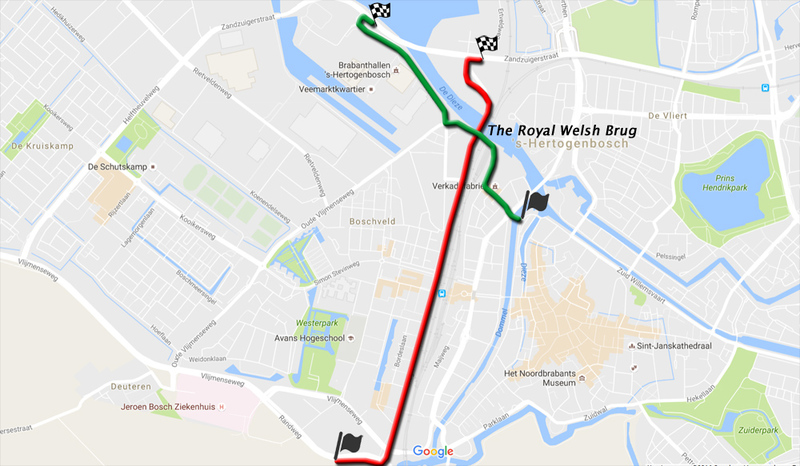 This entry was posted on 29 November 2016 by Bicycle Dutch in Original posts and tagged ’s-Hertogenbosch (Den Bosch), bridge, history, Wales.